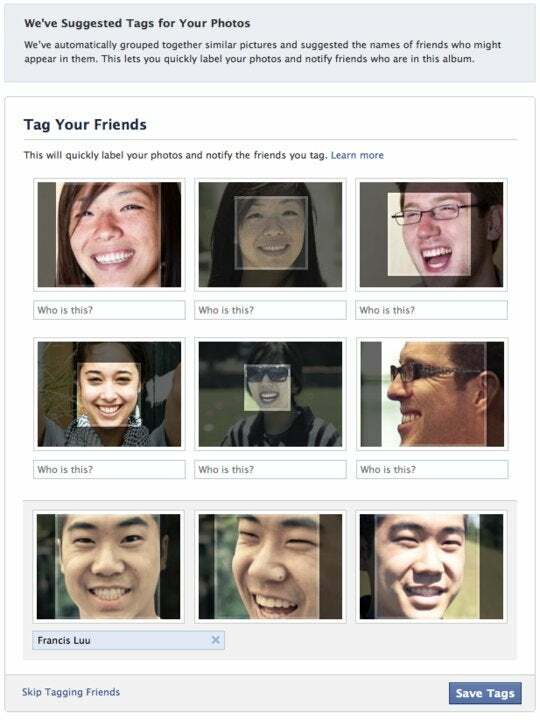 Facebook users in the United States will be able to use a face detection feature for photos, making the tagging process easier. The feature, which debuts next week, uses face recognition software to look through your current photos and will match people in new photos to those who you have already tagged. The new feature, part of the photos application on Facebook, will group similar photos together and suggest the name of your friend in the photos. This will be especially handy when you want to tag a group of photos from the same event, so you won't have to manually tag the same people in the entire album. Facebook engineer Justin Mitchell explained in a blog post that the social network, boasting more than 500 million users worldwide, took several steps to ensure that another privacy fiasco wouldn't break out. If you don't want your name suggested in other people's albums, you can disable the feature from the site's privacy settings menu. This way, your name will no longer be suggested in photo tags, but (again, depending on your settings) your friends will be able to tag you manually in photos. Facebook says that more than 100 million people tag photos every day, making the photos application probably more popular than any other dedicated photo-sharing service on the Internet. In September, Facebook also introduced some other improvements to photos, such as higher resolution uploads, a new photo viewer, and easier tagging and uploading. Meanwhile, Facebook founder Mark Zuckerberg has been named Time magazine's Person of the Year for making the social network "a permanent fact of our global social reality." Zuckerberg got the title by a brow from Julian Assange, the man behind the WikiLeaks saga.